You are here: Home 2013 August How to Troubleshoot OSPFv3 Frame-Relay? Open Shortest Path First (OSPFv3) is a link state protocol that supports IPv6 and as well as IPv4. OSPF version 3 differs from OSPF version 2 for IPv4 as some changes have been incorporated to facilitate IPv6. 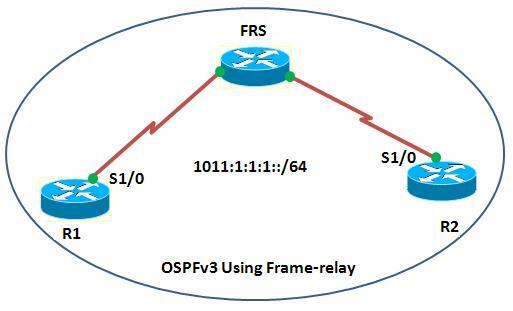 This article demonstrates how to troubleshoot OSPFv3 fail to form neighbor adjacency when configured using Frame-Relay. The OSPFv3 uses Link-local address to form neighbor adjacency by sending and receiving the hello packet to the neighbor router. While configuring OSPFv3 using Frame-Relay one should remember the difference that the DLCI mapping should be done for the Link-local addresses. The OSPFv3 neighbor adjacency will not be formed, until their link-local addresses are mapped to the appropriate DLCI’s. Note: Prerequisite: It is assumed that the reader has an understanding of OSPFv3 and Frame-Relay. The two routers (R1and R2 ) in the network diagram are connected to a frame-relay switch via serial interfaces communicate with each other using OSPFv3.The routers are configured with loopbacks and OSPFv3 is advertised on each interface using the command ipv6 ospf <process id> area <area id>. Note: All configurations are tested on Cisco 7200 Router running IOS 15.0(1) M5 software. In the above configuration, the frame-relay DLCI mapping is done to the IPv6 global address. 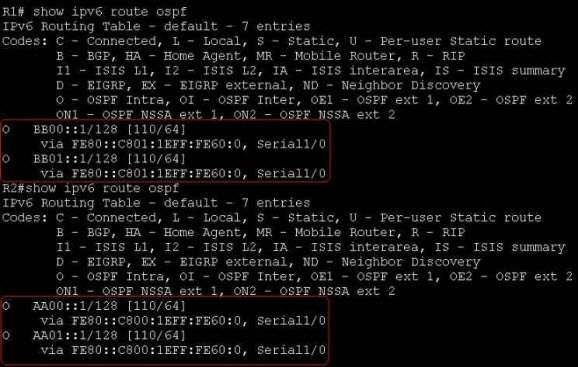 To verify the ospfv3 neighbor adjacency uses the command show ipv6 ospf neighbor in router R1. The above output shows that the hellos are being sent and received the OSPF peers and DR/BDR election has happened but still the routers are in EXSTART state. 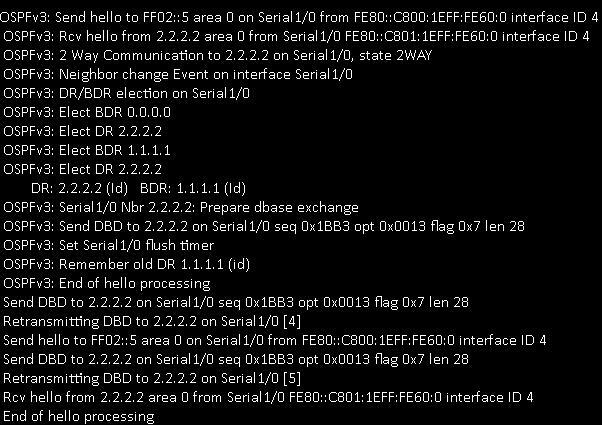 Using debug commands, debug ipv6 ospf adj and debug ipv6 ospf hello debug the adjacency events and hello events. The above debug output confirms that the hellos are being sent and received by OSPFv3 peers. R1 send the DBD database description packets to router R2 but never receives acknowledgement.The EXSTART state indicates that the DR/BDR election has happened and initial DBD packet is sent. You can see that as soon the DLCI mapping is done correctly to the link-local address of the neighbor, the OSPFv3 neighbor adjacency is formed between the routers R1 and R2. The above output shows that the routes are successfully received by both routers R1 and R2.